Recently I have been taking photographs for iCandy, the well known company who make top quality pushchairs which sell all over the world. 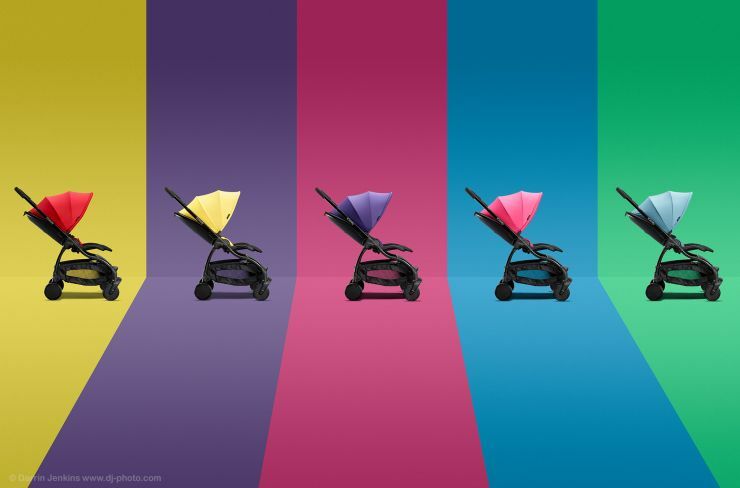 Each pushchair was photographed separately, cut out and placed onto a coloured striped computer generated background (created in Photoshop). The shadow was shot as a separate image and then combined with each pushchair. Not every chair was a straight shot either, there were several photos taken of each and then combined in Photoshop to give the best appearance of the mesh luggage carrier and hoods. The 16 layer Photoshop file was flattened and supplied as a 450ppi to the correct dimensions for across the track tube posters. Testimonial from Thom Bateman, head of marketing at iCandy.